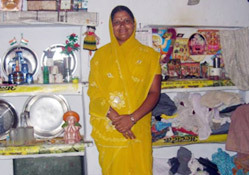 Janki Devi lives with her husband Bhanwarji, and her two children (son Ravi, 10 years and daughter Pooja, 9 years) in Kathputli Nagar, Jaipur. She is one of the first women who joined our project and an exceptional role model for everyone around her. 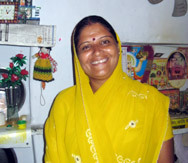 Janki married Bhanwarji when she was 17 and was always keen on earning money to support her family. The last job she had, however, (selling vegetables on the vegetable market) was not liked by her husband, because he didn't want her interacting with men all day. From the very first day she joined the program, she was extremely motivated and keen to learn. Unlike some of the women, who have to be reminded to attend classes regularly, she always showed up on time, and was always keen to learn. She started with Hindi literacy classes, English, tailoring and beautician (simply the number of classes she attended shows how motivated she is! ), but she soon discovered her passion for the beautician work. During one of the advocacy sessions when we asked the women about their dreams, objectives, and how they think they'd be able to fulfill them, Janki said that her biggest dream is to be more self-dependent, to earn money so that she will be able to support her mother and her children without asking her husband for money, and to provide education for her daughter. These reasons fuel her motivation to work hard during the classes in spite of her husband who is not always happy with her leaving the house and the household work behind to learn how to do a facial or how to speak English. Another obstacle she is facing is the fact that her positive progress caused jealousy among her neighbours – for some she is an inspiring role model and huge motivation but for others she seems to be a threat, because she does what many others don't dare to do or don't have the energy to do. But she also gets a lot of support especially from the volunteers who are working at the project and that encouragement keeps her going.